Dr Divya Nambiar was Senior Consultant, at the office of the Union Secretary, Ministry of Skill Development and Entrepreneurship, Government of India. 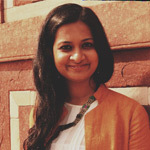 Over the last three years (from February 2015- January 2018) she has worked on the formulation and design of national policy and programme initiatives; managed international cooperation and key strategic partnerships for the Ministry and also provided evidence based policy advisory support to the Ministry. She completed her PhD in Development Studies and is currently working as the Skills and TVET Lead at Oxford Policy Management.